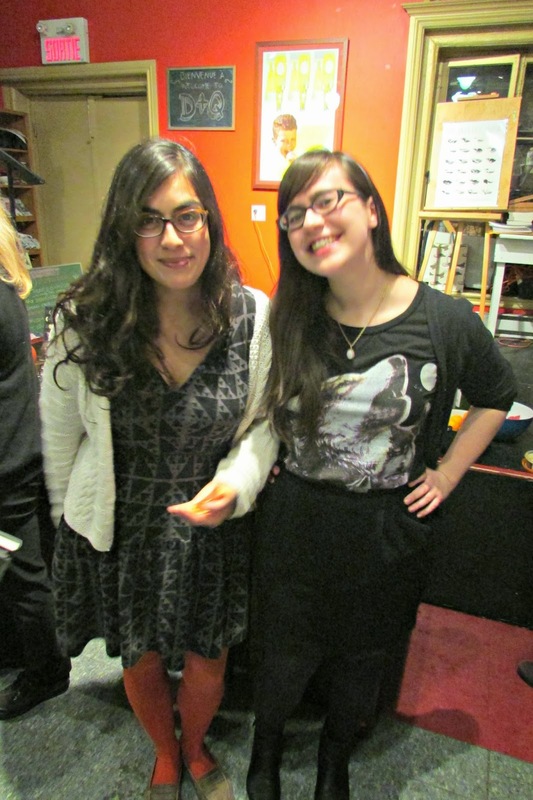 211 Bernard: Haunted bookstore event recap! On Wednesday, October 30th (that is, the eve before All Hallow's Eve) things got pretty spooky here at D+Q! 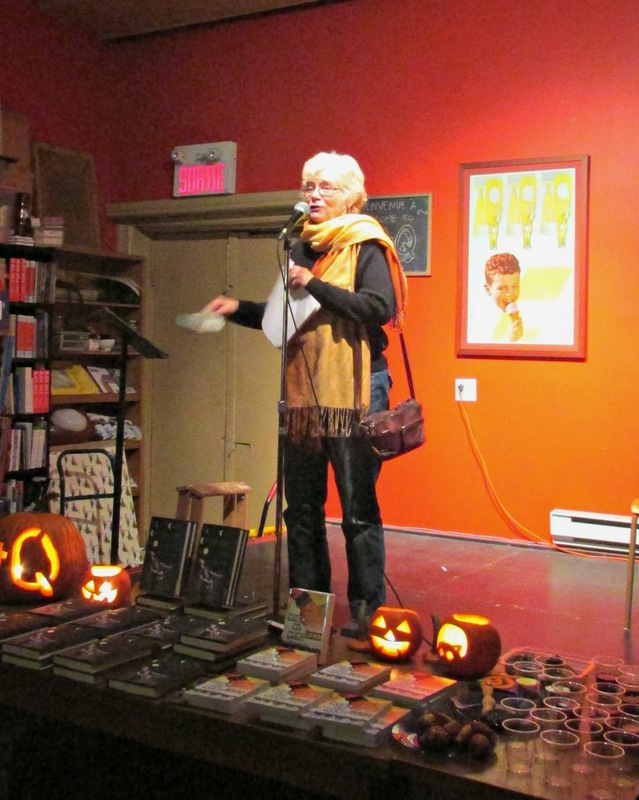 Specifically, we hosted an evening of scary stories from some great authors, including Emily Pohl-Weary, Suzanne Sutherland, Mike Spry, Adam Leith Gollner, Marianne Ackerman and Mary Soderstrom. 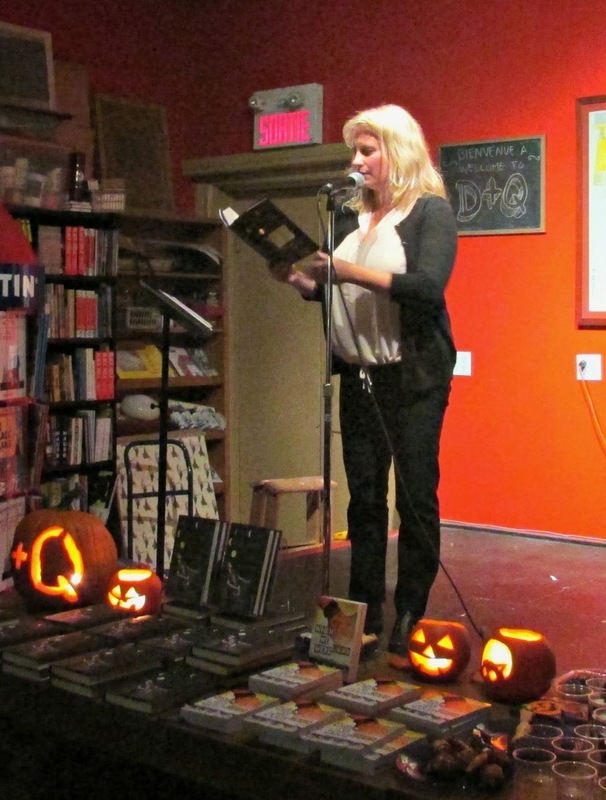 With spooky snacks on the table, and equally scary tunes on the stereo, we were treated to readings that ran the gamut from funny to downright eerie! First to take the stage was Mike Spry, who wore a truly terrifying costume: "I'm dressed as my mother's disappointment," he explained. He read a story about a boy and girl who fall in love in Montreal and pass several happy years together, until the girl quite suddenly transforms into a monster obsessed with marriage and a life in the suburbs. The boy narrowly escapes this fate by fleeing from her in a shopping mall, but has to leave the city altogether, and the girl he once loved continues to haunt his nightmares for years to come. Yikes! Marianne Ackerman was next up, with something a little different. Rather than reading, she recounted a harrowing tale of a trip to the hairdresser gone awry. After a lifetime spent growing out bad haircuts, she eventually ascertained that the price paid doesn't necessarily determine the quality of cut. With that in mind, she decided to go to a hair school, and was happy that one of the teachers there volunteered to cut her hair. But the woman's scratchy fingernails and cold hands (despite the hot water of the shampoo portion) were a harbinger of worse things to come, and unfortunately the haircut, like so many that came before, was a catastrophe. 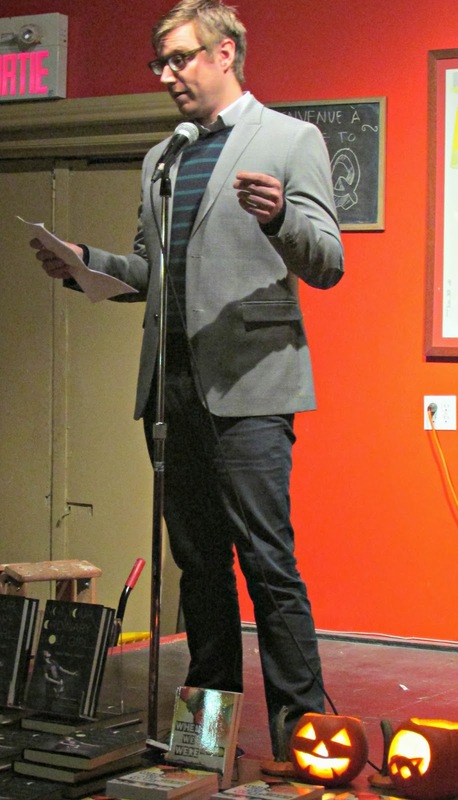 Adam Leith Gollner opted to read a little-known fairy tale entitled "Auntie Tooth Ache" by Hans Christian Andersen. The story follows a young boy and his aunt, a woman with a proclivity for giving sweets to children, who is convinced that her nephew is a poetic genius. One night, everyone in the house is fast asleep, a horrifying specter enters his bedroom and tortures him with the worst toothache imaginable. Her claim that it's for the good of his poetry because "great poets have great toothaches and small poets have small toothaches" is enough to make him swear off of writing poetry for the rest of his days. Then Mary Soderstrom read a sinister tale of a romance gone wrong between a cashier named Sylvie and her boyfriend Anthony, who always shows her a good time, but seems to be perpetually up to no good. A neighbourhood 'crazy lady' tries to warn Sylvie about the wages of sin after spotting what she claims is the mark of the beast on a 20 dollar bill, but Sylvie and Anthony are doomed nonetheless! 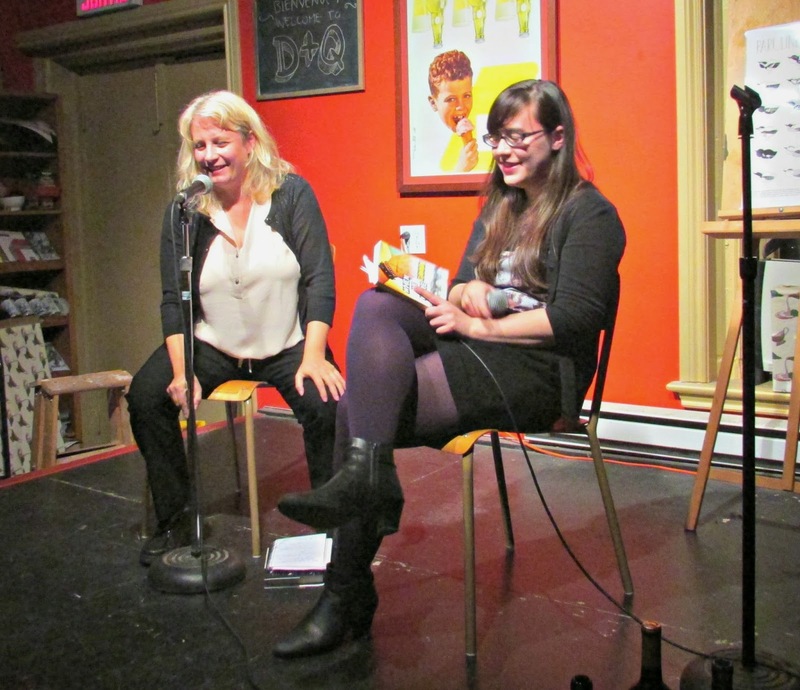 The next reader was Suzanne Sutherland, sporting her sweet wolf t-shirt for the occasion, pictured here with D+Q's Julia. (We were so distracted by her reading that we didn't get a photo until after the fact!) She read from her recent novel, When We Were Good, which chronicles the teenage struggles and triumphs of a girl named Catherine. After losing her grandmother and falling out bitterly with her onetime-friend Megan, Catherine finds herself contemplating suicide on the Bloor Viaduct. But with a new friendship (and possible love interest) and a new-found sense of belonging in the punk scene, Catherine tries to turn her life around. 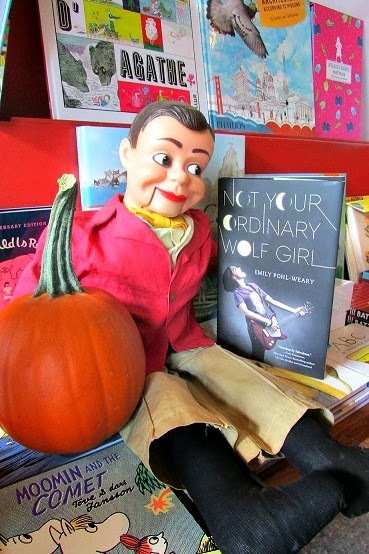 Next, the night's headliner, Emily Pohl-Weary read from Not Your Ordinary Wolf Girl, her story about a teenage girl named Sam Lee, who is a bass-player in a popular rock band named Tenement Girls. Despite the band's success, Sam suffers from stage fright, especially when she spots her mega-crush Harris in the audience. In the passage Emily read, Sam, a former vegetarian for political reasons, soon becomes an avid carnivore after tangling with some ferocious dogs in central park on a post-gig bicycle ride. And this is just the beginning of her transformation from reluctant rock star to teenage werewolf! Then Emily and Suzanne asked each other some questions and answered those posed by the audience. A conclusion they both agreed upon: teenage girls can be monstrous to themselves and each other! After the Q+A, everyone stuck around to enjoy the spooky snacks, music and decor before heading off into the night. 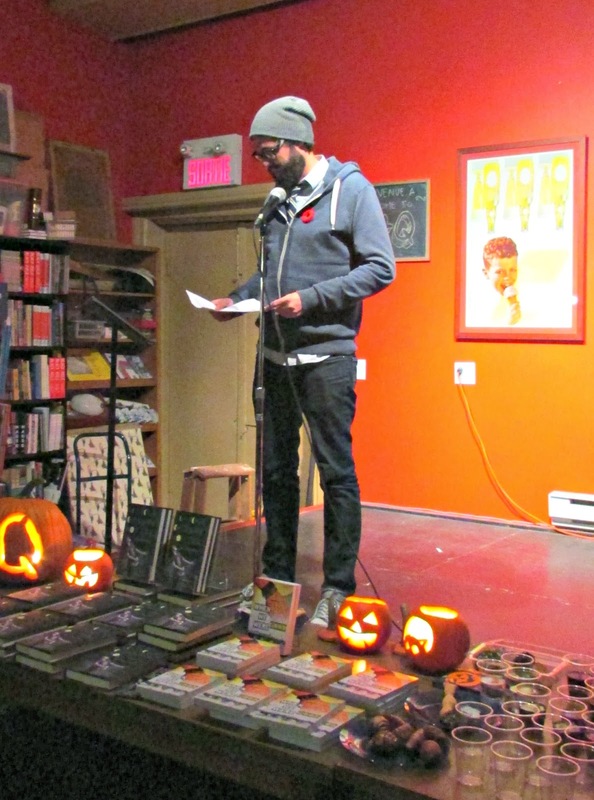 Many thanks to all the brave souls who came to the haunted bookstore to get into the Halloween spirit with us.